So total bizarre moment... As I was prepping to write this post I pulled up my post of when I was 28 weeks pregnant with Will. I hadn't looked over my posts in a long time so imagine my surprise when I was wearing basically the same outfit (different outer shirt). I guess we'll just call it my pregnancy uniform. Want another fun fact? Will took this photo. The little guy is all about taking pictures right now and so we killed some time the other day with the tripod and I just let him snap away (got to love digital!). 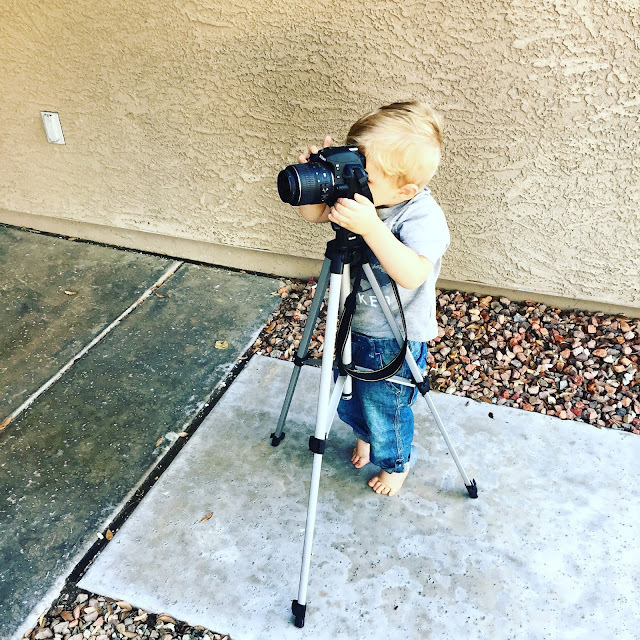 He wanted to take my picture so I decided to let him go and see if anything came out. I think we'll make him the official baby bump picture taker from now based on how these came out :). Time has been a little tight recently so I haven't really documented this pregnancy like I did with Will so I thought it would be fun to do some comparisons of this pregnancy compared to the last one. The first trimester this time around was overtaken by a really bad case of bronchitis so everything else seemed minor in comparison. We also were packing up the house and moving so the extreme tiredness could have been due to the pregnancy or everything else, but boy was I tired. 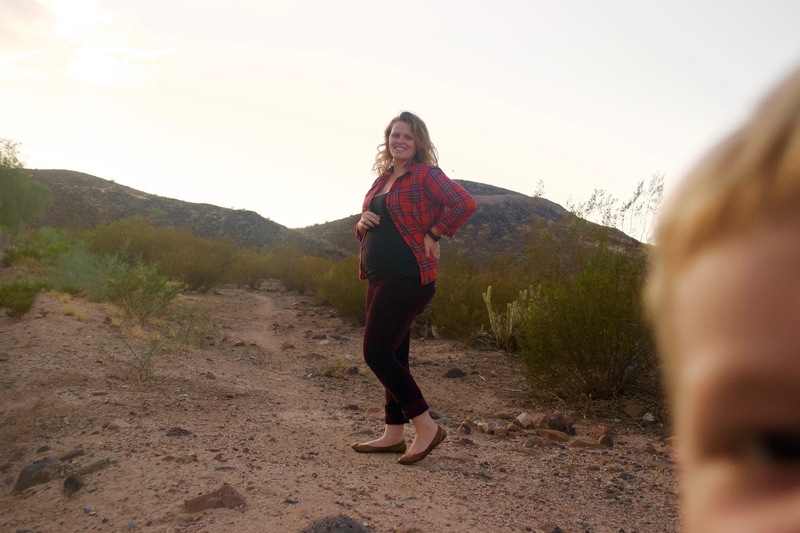 I luckily didn't have morning sickness again and by the time we were in AZ I was in my second trimester and they were finally willing to give me some antibiotics! 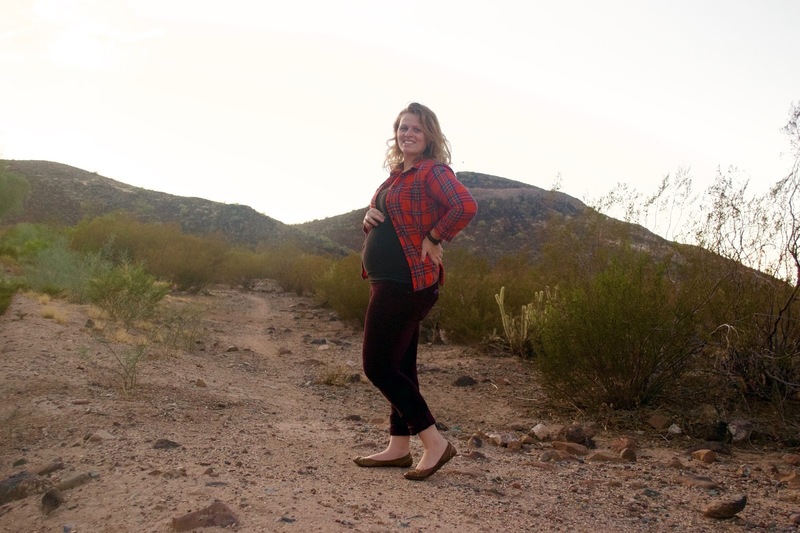 With Will, my second trimester was when my hip pain started pretty badly and this time around I managed to get to the third trimester without any major issues. I've had a few rough weeks but nothing compared to Will. I think it's mostly due to the fact that this baby isn't sitting so tight in as Will did. I did my nothing but peaches routine again first trimester and transitioned into any high water content fruit or veggie (watermelon, cucumbers, tomatoes, etc). I had more aversions to food smells this time around and lived off of tomato sandwiches and cucumber sandwiches for a few months. Now that I'm back on normal food, the only strong persistent craving I've had is for sweets... and not sweets I normally like but like cake and donuts. My belly is a lot bigger this time around (don't blame the donuts!) which has helped with the hips and people noticing I'm pregnant. I however did have a pretty funny encounter with a co-worker when my radiation badge fell on the floor and he picked it up and asked why there was a baby on my badge (you get a special one when you're pregnant). I've gained about 10 lbs and I'm measuring about 2 weeks big at this point. This baby is considerably more active than I remember Will being. There are some days where she doesn't stop moving all day and I can just watch my belly jump around. I can distinguish rolls (which make me a little nauseous) and kicks and the size of my belly (and my ability to walk) seems highly dependent on her position. I'll have days where my maternity pants barely fit and then the next day I can fit into my (largest) regular jeans. It's weird. We are literally building baby girl's room right now so I think that epitomizes nesting and we did a similar thing with Will. It's nice to have full creative control over a space and apparently we really like the time crunch. I'm also having probably too much fun buying little girl clothes. Most of Will's baby clothes were given to us from friends who had boys a little older than Will and so I didn't really shop for clothes for him for awhile. I cannot resist bay girl clothes though and crazy Gap sales and so we're filling out the new baby's wardrobe quite quickly. So those are the major highlights so far. We are about two and a half months away from my due date so we're in major reno mode! Here's hoping everything goes smoothly and we get everything finished ahead of schedule.